Second quarter earnings reports have come and gone, and there were two particularly interesting pieces of news coming from American. First, American announced it will begin allowing Basic Economy travelers to bring regular carry-ons onboard. And second, American isn’t growing much, but what growth it has will be focused on two places: Charlotte and Dallas/Ft Worth. It might not sound like it, but these two initiatives have one thing in common. They’re both an effort to catch up to Delta. Let’s start with the Basic Economy move. When American introduced Basic Economy, it, like United just before it, put a carry-on bag restriction on the fare. Anyone who bought Basic Economy (with a couple exceptions) could bring a small personal item to fit under the seat but nothing more. This wasn’t competitive with Delta, which rolled out Basic Economy long before American and United but never had a carry-on bag restriction. …for prices to the customers who are the buyers of this, there’s a big airline out there who doesn’t charge for the carry-on and there are now filters on things like your Google search that ask you if indeed you want to bring a carry-on or not, and if you say yes, all of a sudden the American flights don’t show up nearly as high as they did before because it adds $20 to our fare. Nothing wrong with that, that’s accurate. 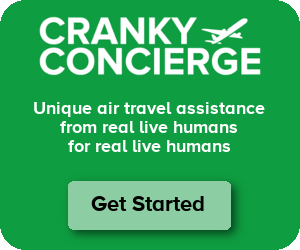 But when you get yourself in a position in this business where price-sensitive customers find themselves with lower fares on truly competitive airlines like that, we have to take that under consideration. And that’s what it is. We put this product out with a different model than others had done in the past, and we’ve gotten to the point where we think the right thing to do is to get in line with the competition. True, Southwest also has no restriction on carry-ons for its lowest fares, but that’s not the “big airline” that Doug’s talking about. You can’t easily compare Southwest to American online since Southwest doesn’t participate in any of those sites. But Delta does, and when you go to Google Flights you see a lot of filters, including one for carry-on bags that gives Delta a big advantage. When someone flips that switch, Delta will be able to show its Basic Economy fare including carry-ons while American can’t. And that is apparently hurting American enough to get it to change its policy. This will have some negative financial impacts. The airline’s head of Revenue Management Don Casey thinks this policy will drop the percentage of people who buy-up to regular coach from 63 to about 50 percent. But American will now be able to attract those low-fare hunters who were increasingly choosing Delta. United doesn’t agree so far, and it says it isn’t changing, but as online travel shopping sites get better (ever so slowly) at showing product differences, the airlines will lose their ability to win on confusion. It sounds like thanks to Google Flights having that simple carry-on filter, American had to rethink this. You could probably see pretty easily how this was Delta-influenced, but what about American’s growth plan? That’s a bit more subtle. American talked about this a lot in its most recent earnings call, but I think Doug Parker said it best. If you look at where our growth has been over the last year at American, it’s not been in our most profitable hubs. Indeed, we’re building up LAX, which is the right thing to do. Long term strategic, it was some growth in Philadelphia in response to some competitive incursions there to make sure that we were competitive. But not in places like Dallas and Charlotte, and not in places like our strongest hubs, which some of our other competitors did. Apparently in the last year, American has focused on what it would call strategic growth. It may not be the most profitable place to put airplanes, but it’s still important for one reason or another. That’s done. Now American is going to focus on where it makes the most money, and that is in Dallas/Ft Worth and Charlotte. This might sound obvious, and really, it is. American is getting 15 new gates at DFW and 7 in Charlotte so it has the room to start growing further in the places where those airplanes can make the most money. Go figure. What does this have to do with Delta? Well, Delta’s already done that. Atlanta is the holy grail of hubs with an incredible amount of throughput, and American wants to create an Atlanta at DFW. Charlotte won’t get nearly as big, but it has room to get bigger and bigger in a very profitable way. In short, American will continue to grow in its hubs so it can try to get an Atlanta-like position. Meanwhile, Delta has moved beyond its hubs to try to cultivate new frontiers. We’ve seen Delta start to build up Boston into a focus city. Raleigh/Durham is now one as well. And there’s talk of Austin being the next place Delta goes. So while American tries to get bigger in its hubs, Delta gets broader in strategic markets, chipping away at the loyalty people in those cities have to other airlines. None of this is to say that American is doing the wrong thing. What American is doing makes sense. As usual, however, Delta is ahead in this race. This question on American’s earnings call from JP Morgan analyst Jamie Baker couldn’t be more accurate of the way many see AAL right now. Years ago, American built dual hubs in BNA and RDU to try to capture flow that goes over ATL; both hubs failed and DAL only grew larger in ATL as it cemented its position as the world’s largest hub after Eastern shut down. ATL has certain geographic, market, and competitive advantages that no other hub is going to duplicate. CLT Is the closest runner up to ATL but it is a much smaller market; hubs can carry lots of connecting traffic but only work to the extent there is a local market and global connectivity and CLT has proven it can’t come close to supporting the amount of worldwide flights that DL has from ATL. DFW is much further from the population mass of the US which means longer flights and less connectivity in the same amount of flying time so American’s costs to generate the same amount of revenue as DL are much higher. Plus, DFW is a very inefficient terminal setup; Doug Parker has said that AA has far more employees at DFW than other airlines at other hubs because of the configuration of DFW. And specific to the economy basic concept, DL pioneered it among US global carriers and yet AA and UA chose to take away the overhead bin policies that DL started. Adding back overhead bin access might solve some of the problems w/ competitiveness with Delta but getting more economy basic passengers is not going to solve AA’s structural problems including much more debt which costs much more of AA’s revenue to service with little to no advantage. AA has some major competitive and structural issues to address and Jamie Baker’s comments highlight that the future for AA is not going to improve until they address them. Meanwhile, other carriers including DL will continue to chip away at AA’s strength markets as CF notes. I agree with Tim. This isn’t driven by a “copy Delta” strategy from a position of strength but more desperation/knee jerk reaction to their very poor financial performance. I just listened to the AAL earnings call and the difference between that and UAL’s was like night and day. Parker just bumbled along while Munoz and Kirby handled the questions very assuredly, which reflects the situation each airline is in. I’m sure Delta’s went fine. United beat American on operating margin by 2%, with a year on year margin swing to UA of 3% and to DL of 4%. It’s only one quarter, but the outlook looks clear that UA has taken the #2 spot. with DL continuing to soar. United completely botched its merger, and it took 6 years, plus a change n CEO and overhaul of senior management before they started to significantly fix things (especially labor contracts) and 2 years later those changes are starting to flow though to the balance sheet. UA’s Q2-18 ex-fuel unit costs fell 0.4%. AA’s merger wasn’t as disastrous but they’ve let a lot of things fester (note labor contracts) and their costs are out of control (ex-fuel CASM up 2.4%). It looks as though far more fundamental restructuring (and fixing those labor contracts) is required; it’s 5 years since their merger. AA’s ex-fuel CASM was up 2.4%. And AA’s “reduction in capacity growth” also includes significant route cuts including ORD-PEK (with AA hinting that PVG and NRT may also be cut). Shrinking business routes from Chicago is music to the ears of the others, especially for UA in ORD but also DL in the midwest, to take market share on high value business fliers. Capacity control doesn’t just mean cut your way to profitability (or decent EPS) as UA found out to its cost in 2010-15 and is now correcting. Delta executed its merger superbly and so deservedly remains the King of the Skies, and barring a catastrophic mess up (which nobody expects) will remain so. But UA’s taking over the #2 spot is significant and if they and DL can pick up market share off American it doesn’t bode well for AA. ATL works so well for Delta because it’s a super efficient airport setup. CLT and DFW can’t compete in the same capacity just due the the architecture of their layout. I’m not sure who came up with the plan to convert ATL into the concourse layout it is today but that person was a genius and responsible for laying the foundation of the worlds busiest airport. Atlanta had a couple mayors in the 70’s who were very forward thinking and aggressive about promoting air travel and infrastructure. Not sure they designed the layout themselves but it certainly wouldn’t have happened without them. Their names are pretty familiar now… William B Hartsfield and Maynard Jackson. In comparison, it once took me over 40 minutes (and at least 6 escalators, both up and down) to go from gate to car rental counter at MSP. Going from a small regional to a larger mainline plane at CLT is a hike as well. Another underappreciated aspect of ATL, especially in the Southeast where pickup trucks rule, is that it's connected to MARTA (Atlanta's public transportation system), and also has easy connections to a nearby convention center. Not true. Where are AA’s 9 seats per row-configured 777s? And the comfy A350s for longhaul? Where is AA’s order for the customer-pleasing A220s with its wide cabin and seats? There may be Delta envy on the part of American, but no following of DL on the thing that matters most, and the financial results are proving people pay for, customer experience. Let’s not underestimate the impact of Kirby and other exec moves from American to United. Parker has a history, for better or worse, of trying something different and making adjustments when it doesn’t work. He also has a history (even at America West) of retrenching when things get bad, and rebuilding as things get better. It seems to me that American and Delta are doing the same things network wise, but they’re doing them in reverse order. United is also building up its hubs, one of which, Chicago, competes head-to head with American. All of this adds competitive pressure to an industry that, according to many armchair CEOs, has consolidated its way to a point where it’s not competitive – allegedly. Delta has more fortress hubs than its competitors, which is a major structural advantage. United has only two fortress hubs, but its others are in excellent locations. American’s southeastern hubs (Dallas-Fort Worth, Charlotte and Miami) surround Atlanta. Southwest cherry picks the country’s larger markets and doesn’t serve smaller areas, thus avoiding the higher unit costs of regional airlines. Every airline has holes in its network. None can be everything to everyone. That’s good. Because all of the airlines have strengths and weaknesses, each has to determine its own market niche and business plan. I, for one, am happy to see profits where losses would have been the norm ten years ago. I’m also happy to see airlines that aren’t afraid to be a bit different in their investment approaches and product offerings, instead of simply being in survival mode. The airline industry has suffered from under investment for years, and it can be argued that American was the worst in terms of deferring improvements. It’s now paying the price. Delta has a five year head start on American. United is three years ahead. It’s too early to fully assess the long term future of the airline industry. Let’s see where the industry is ten years from now. United turned me off to their Basic Economy with one fatal flaw: the requirement to be at the airport to complete the check in process an hour before the flight. I was fine with last to board, no overhead access, no MQMs, etc. However, if I just have a backpack or an underseat bag, there is no reason to be at the airport that early, especially those with pre-check. Not even Spirit or Frontier have such a draconian policy. Parker might also have been correct that the best way to price Basic Economy is without a free carry-on — inducing more people to upgrade to regular coach. This gives a legacy carrier the most leverage when dealing with the “come on” pricing of the ULCCs (who make half their money on ancillary revenue). But what can he do if DL “stupidly” doesn’t go along? He loses customers, so he has to match DL’s policy, even if it’s not revenue-maximizing. Every major airline is in a different place in it’s history, especially with regard to the merged entities. There is no one in the industry who’s done more to make this industry profitable than Doug Parker. The industry basically followed his blueprint to consolidation. Parker built the world’s largest airline out of basically nothing (money-losing America West airlines). He, along with Scott Kirby and Derek Kerr, are the industry’s true disrupters. Those who think DL will somehow run circles around Parker in the future are making assumptions that don’t have much support from a true analysis of history. The idea that Parker has lost his mojo because of one slightly-below-industry-average-quarter seems naive. Let’s see what happens during the next couple of years. e.g. not ordering 787s. Apparently the current management has a more flexible philosophy. Anthony – I don’t see how Delta followed the leader. Delta actively created a strategy to go for lower cost airplanes when the opportunity struck. Sure, you could say United led by ordering the 787 early, but Delta also led by shunning newer aircraft and instead finding more creative, cheaper ways to get aircraft it needed. In fact, United then turned around and borrowed the strategy when it started looking for used aircraft. to add, the 787 order, IIRC, came from NW and DL said the economics of the 787-8 didn’t work. They ordered the A350 before the 787-9 came into widespread use but did say the 787-9 or the 350-9 could have worked. The deal was sealed because of the low prices that Airbus could offer the 330NEO for as a derivative aircraft with new generation engines. Both the 330 and 350 have wider seats than the 787 in configurations that AA and UA use in coach while the 350-9 holds more total seats than the 787-9 for either AA or UA which very likely gives DL better economics. And the comment about the A220/CSeries is probably going to be a bigger deal. DL will have an aircraft that has better per seat economics in a 110 or 130 seat version than any other US airline for 5 years before B6 starts getting the A220 in sufficient numbers for it to begin to impact their bottom line. AA has said their finances don’t support a new generation small mainline aircraft which leaves them very vulnerable as DL grows its focus cities and adds routes to/from other airline hubs. For example, DL is already using A319 and A320s on some of its flights from DFW to LGA and LAX and the A220 is widely expected to heavily serve LAX and NYC to Texas routes. and the A220 will be one of the most spacious commercial airliners with plenty of overhead bin space. . I recall a quote from a DL executive, to the effect that “we don’t want to be the ones to assume the risks of a new aircraft,” referring specifically to the 787. And you could certainly say he was proven correct, what with the 787 delivery delays, battery problems and such. [IIRC, the A350 systems were still being finalized when the 787 battery fires hit the news. So Airbus still had time to opt for older battery technology instead of lithium units.] Maybe when it comes to new-technology aircraft, it’s wiser not to be first in line. But of course, today’s DL has ordered the CS100 (oops, A220), and declared that they want to be the launch customer for the “797.” So it definitely seems like a change in philosophy. Playing devil’s advocate……..The “shunning newer aircraft” strategy works well today, but at some point in the future, the older aircraft will fall into the category of “gas guzzlers” and will have a higher degree of maintenance related issues. This will force Delta to buy newer aircraft and take on more debt at that time. There are less airlines today to buy used aircraft from, and now that UA has followed a similar strategy, the secondary market for used planes may dry up quickly. One could arguably say that AA take on a lot of debt for new planes now (while borrowing rates are very low). In several years, DL may be borrowing at much higher rates. Eric – It wasn’t a strategy of shunning newer aircraft but rather a strategy of shunning high-demand new aircraft. When airlines were ordering MAX and neos, Delta placed an order for current generation A321s. It took the then-CSeries when the manufacturer was desperate. So it was about lowering aircraft ownership costs even if operating costs would be higher. The math made sense for Delta. It’s not as easy to do now because other airlines have figured it out. I liken it to the Oakland As back in the Moneyball days when nobody else was looking at players the same way. They were able to pick up great players because they evaluated the game differently. How does that make them a follower? They are the only US airline flying the A350, which from what I understand is a nice ride as well. So, what DL does is follow their own path and it has worked out extremely well for them. Delta has lost the possibility of ever getting revenue from me now that they’ve announced that they will start putting peanuts on their airplanes. And as Southwest has gotten rid of them, and as their planes go through deep cleaning, they finally become an airline that I CAN consider (though I despise their boarding methods). I’ll stay loyal to Alaska thanks to being MVP Gold but when pressed for options, I’ll start considering American and maybe SW again. Sorry, Delta. I don’t care WHERE you fly or how often if you’re going to serve snacks to kill me. Do you actively avoid all places that may serve nuts at their place of business (fairs, farmers markets, restaurants, rodeos)etc? Do you not go into grocery stores where they have nuts, because it’s life threatening to you? What about picnics? Movie theaters that have nuts/dust? Sounds like you want everyone to cater to you. If it can kill you stay home with your medication. I’m allergic to bees/wasps & cats. Does that mean I can’t go to the lake, park, hiking etc. No, it means that I come prepared just in case. The world doesn’t revolve around you, nor I.
Julia also doesn’t apparently realize that many businesses will not guarantee that they will not an allergy free environment for any specific substance because there are legal implications in saying that you will do so and not being able to deliver. No airline can require that passengers leave their own peanuts off of the plane just as airlines cannot guarantee that you will not be exposed to pet dander which I would bet is a health hazard to more people than peanut allergies. Your point is completely valid, Scott. Americans have come to expect that everyone should cater to their needs. Airplanes are public transportation and if you are so sensitive to anything that might endanger your health, then public places including commercial planes might not be the right place for you. Thinking that any airline can protect your health is delusional if you are that allergic. Since I do not wish to be accused of tossing around the term, do you avoid all zoos? All carnivals…all baseball parks–plenty of peanuts in all of those places. Do all cruise ships that carry peanuts or TSA-inspect all passengers for nuts in carried luggage fail to meet your exacting standards? After all, most cruise ships will take longer to arrive at a hospital than the thirty to sixty minutes for most domestic/transatlantic/S American flights. This is without even touching on the risk compensation effect of people falsely or predictably carrying around their epipens or others antidotes of choice less fastidiously. FYI – Delta has a “Peanut Option” after you book a flight with them. If you are this severely allergic, you can request your flight to be peanut free.